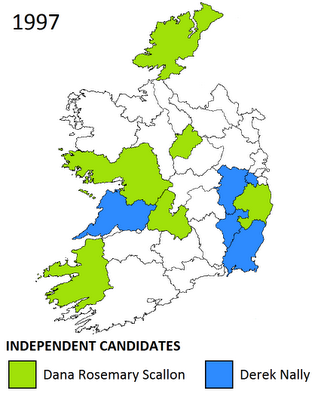 1997 saw the first time Independent presidential candidates were added to the ballot paper via the local councils. Candidates must secure the backing of at least four councils in order to become a contender in the election. This route had been tried only once before, by republican Patrick McCartan in 1945. In that instance he failed to win the necessary four, but managed to get on to the ballot paper anyway through the support of 20 members of the Oireachtas. 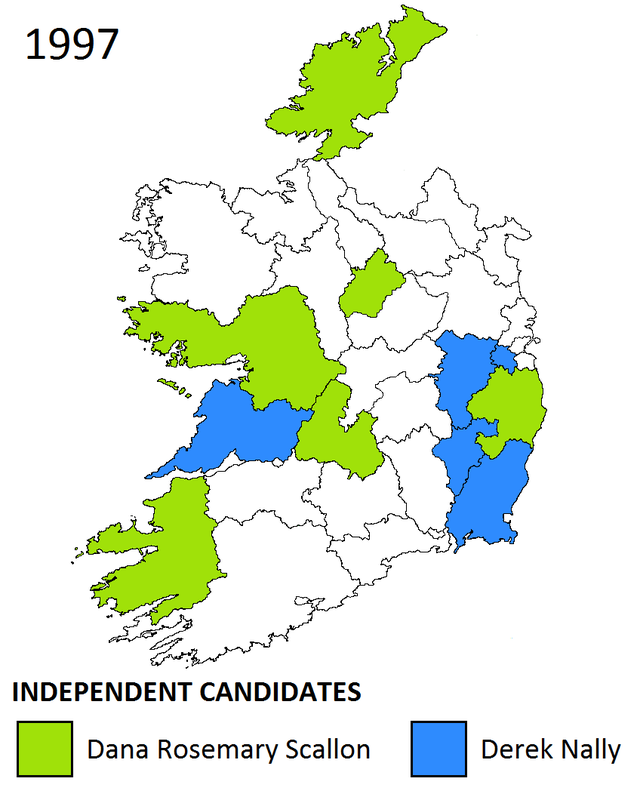 In 1997, two non-party individuals declared their intentions to run for the presidency alongside affiliated candidates Mary McAleese (Fianna Fáil), Mary Banotti (Fine Gael) and Adi Roche (Labour). Former Eurovision Song Contest winner Dana Rosemary Scallon secured the backing of six councils in total, surprising many and setting a new precedent in Irish politics. She was followed by retired Garda Derek Nally, who won the backing of five councils. For the first time, an Irish presidential election would be fought with five candidates, a record which remained for fourteen years, until another election saw the local councils thrust into the spotlight once again in exciting and fascinating circumstances.